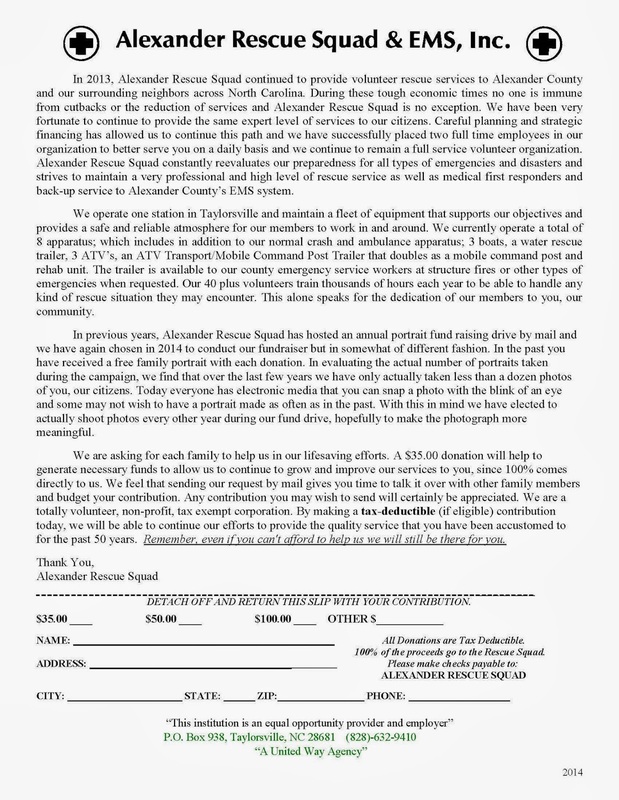 As a volunteer organization, Alexander Rescue Squad relies heavily on the support of the citizens we serve. Our annual fund raiser is about to get underway, and with the amount of scams and fraudulent activities in the world today we wanted to give you a heads up about the letter you will be receiving. The attached letter is an official copy of what Alexander County property owners should be seeing in the mail sometime in the next week. We feel that sending our request by mail gives you time to talk it over with other family members and budget your contribution. Any contribution you may wish to send will certainly be appreciated. We are a totally volunteer, non-profit, tax exempt corporation. By making a tax-deductible (if eligible) contribution today, we will be able to continue our efforts to provide the quality service that you have been accustomed to for the past 50 years. Remember, even if you can't afford to help us we will still be there for you. Are You Prepared For Winter Weather?? ?